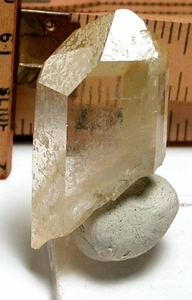 Arkansas golden healer channel faced crystal, super clear, has ROUND second generation quartzes to two prism sides and faces! It's got light natural iridescence* to one broad side and two little rainbows, loads of record keepers, and light devic veils. 3/4x 1-3/4" top to tail, no damage - a great candidate to become a pendant. *as opposed to chemically treated.